FFA - Does Cardinal Dolan really believe Mother Mary worshipped Allah? There is great danger when prominent Catholic and Christian leaders proclaim that Allah is the same as Jehovah and that followers of Islam value the United States Constitutional liberties more than Sharia law. Sadly, many Americans will blindly follow their lead to the spiritual and political empowerment of Islamists. Cardinal Dolan stressed that Catholics and Muslims have a mutual love of the United States and of the religious freedom that this country affords. Your love of marriage and family, your love of children and babies, your love of freedom -- religious freedom particularly-- your defense of life, your desire for harmony and unity and your care for others, your care for God's creation and your care for those who are in need," the cardinal said, were Islamic values also shared by Catholics and areas where there could be mutual cooperation. Is it possible that Cardinal Dolan is unaware that the largest Islamic organizations in the country are fighting to stop dozens of state legislatures from banning Sharia law from being considered in their courts? The Council on American Islamic Relations (CAIR), Islamic Society of North America (ISNA) and Islamic Circle of North America (ICNA) are fervently fighting for Sharia law to be unrestricted in the United States. Is it possible Cardinal Dolan is unaware that many provisions of Sharia law are antithetical to the rights afforded under the United States Constitution? Or is this the “religious freedom” that Cardinal Dolan believes Islamists should have in America? Unlike the followers of Islam who mock the Holy Trinity, Christians believe Jesus is the Son of God and believe in God the Father, God the Son and God the Holy Spirit. Not so for the followers of Islam. The Quran 004.171 states “O People of the Book! Commit no excesses in your religion: Nor say of Allah aught but the truth. Christ Jesus the son of Mary was (no more than) a messenger of Allah, and His Word, which He bestowed on Mary, and a spirit proceeding from Him: so believe in Allah and His messengers. Say not "Trinity" : desist: it will be better for you: for Allah is one Allah: Glory be to Him: (far exalted is He) above having a son. To Him belong all things in the heavens and on earth. And enough is Allah as a Disposer of affairs." Additionally, the Quran 5:17 states “In blasphemy indeed are those that say that Allah is Christ the son of Mary. Say: "Who then hath the least power against Allah, if His will were to destroy Christ the son of Mary, his mother, and all every - one that is on the earth? For to Allah belongeth the dominion of the heavens and the earth, and all that is between. He createth what He pleaseth. For Allah hath power over all things." Sahih Muslim, The Book of Jihad and Expedition Book 019, Number 4366: It has been narrated by 'Umar b. al-Khattib that he heard the Messenger of Allah (may peace be upon him) say: I will expel the Jews and Christians from the Arabian Peninsula and will not leave any but Muslim. The Bible proclaims numerous times “The Lord God, the God of your father, the God of Abraham, the God of Isaac and the God of Jacob” in Genesis 31:53, Genesis 32:9, Genesis 50:24, Exodus 3:6, Exodus 3:15, Exodus 3:16, Exodus 4:5, Deuteronomy 9:5, Matthew 22:32, Mark 12:26, Luke 13:28, Luke 20:37, Acts 3:13 and Acts 7:32. The scriptures do not include Ishmael in this proclamation. Ishmael was the unwanted son of Abraham and Sarah, wrongfully conceived with a concubine. Ishmael is the father of the Arab nations most of which are populated by followers of Islam. 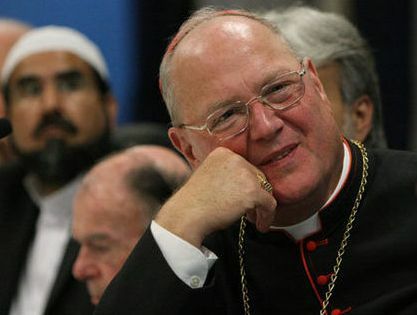 Florida Family Association has prepared an email message for you to send to encourage Cardinal Timothy Dolan to stop making erroneous comments that wrongfully empower Islamists spiritually and politically.